Thanks to Auntie Joanna, we got to swim at her new home at the Monterey Park Condo. Having fun together at the pool were Ming Yi, Ming Chih, Ming Ting and Robyn. While the mothers had fun doing facial, and Daddies Alvin and Edward were talking business. 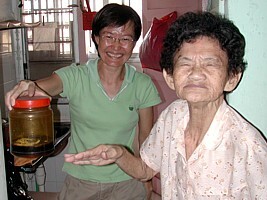 It's once again the annual spring cleaning for the old folks at Kim Tian! 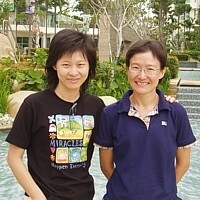 As usual, Michael Chng funded the project and Cecilia Ong organised it masterfully with the help of many members of the Singapore Adventurers' Club. Robyn proved to be a capable helping hand this year. We left the toilet, kitchen, balcony and bedroom spotlessly clean! Welcome the Year of Dog - a year of good health, happiness, prosperity and good fortune for all! 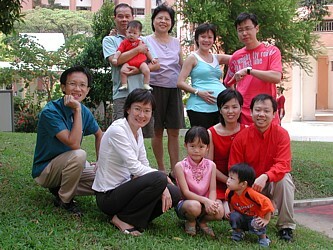 The Yongs on the first day of Chinese New Year at Jurong East. 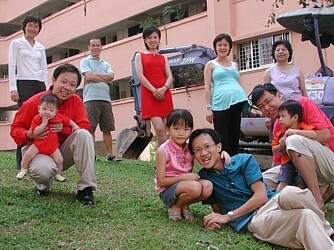 L to R: Jin, Melvin & Skye, Grandpa, Xiao Mei, Robyn & Alvin, Janet, Kwok Lum & Eugene, Grandma.